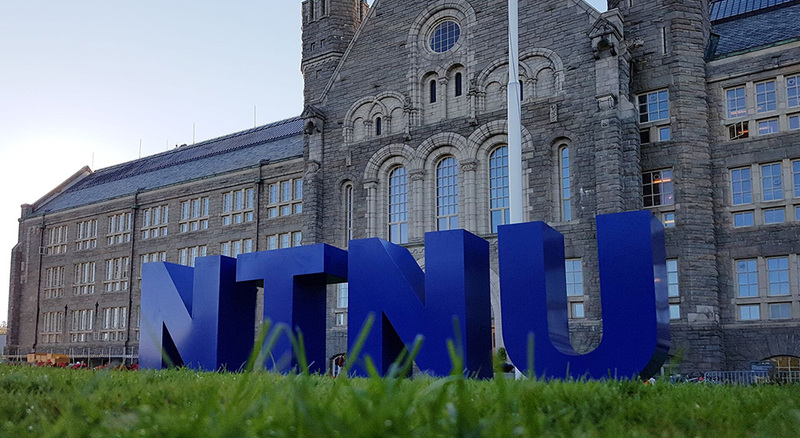 With 40,000 students, NTNU is Norway’s largest university and its top institution for educating engineers. It saw the opening of a new building as a great opportunity to enhance the student learning experience and improve flexibility of teaching by creating a fully interconnected AV suite of lecture rooms and laboratories. The vision was to enable collaboration not only between the teaching spaces on each campus, but also between campuses. This required sharing high quality content in real time. 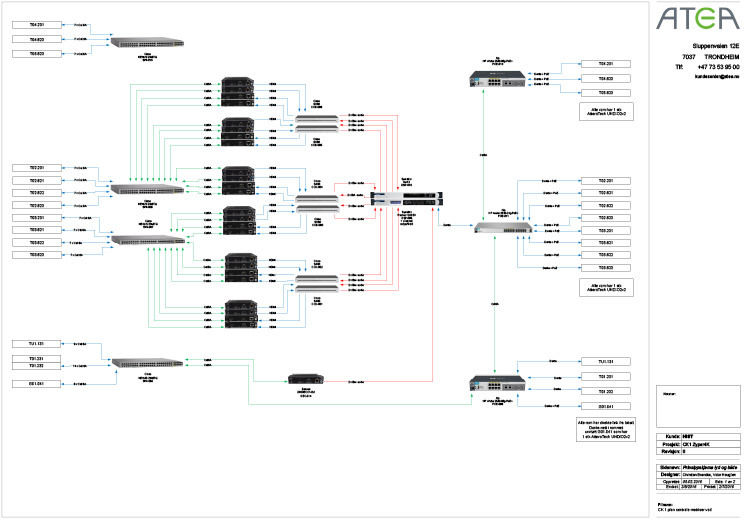 To achieve the required flexible connectivity between rooms, a 40Gb backbone was deployed via two Cisco N5K-C5624Q switches (each offering 24 fiber optic ports of 40GbE). These 40G switches connect two of the university’s buildings through 150 meters of underground fiber. 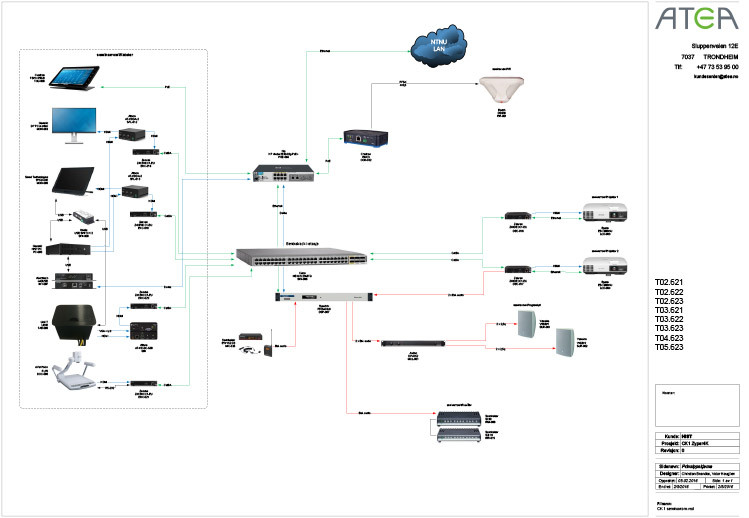 In-room connectivity was provided by Cisco NEXUS 2348TQ 10GE Fabric Extenders, offering 48 ports of 10GBaseT copper connectivity and six 40G fiber optic uplinks. 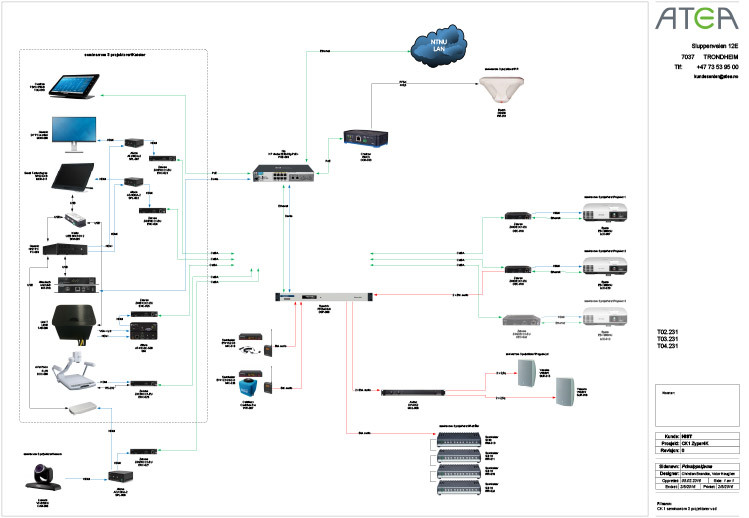 This architecture is fully non-blocking across the 270 ZeeVee Zyper4K SDVoE endpoints deployed in the system. Cisco SX80 codecs are banked in a single server room so they may be utilized from any room in the connected buildings. This saves at least $25,000 per room and is only feasible with SDVoE – the bidirectional nature of codec sharing means DOUBLE the distribution latency, in an application that is already latency sensitive. 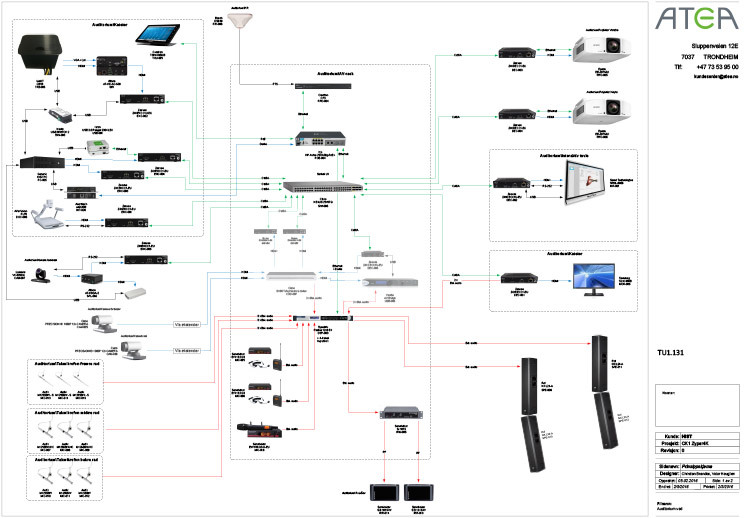 Dante networked audio is heavily deployed. Dante moves all program and microphone audio inside the rooms and between rooms, similar to the SDVoE architecture used for video. 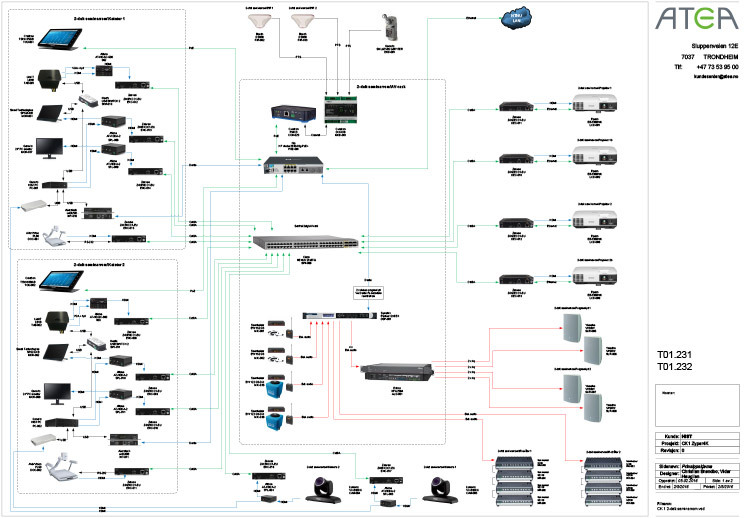 This system demonstrates the power of combining SDVoE – the best solution for video over IP with Dante – the best solution for audio over IP, giving complete routing and mixing flexibility for both audio and video systems. The design drawings provided here are not exhaustive, but are meant to demonstrate the primary design concepts deployed, and the more complex and interesting rooms. There are other rooms, and copies of these rooms. 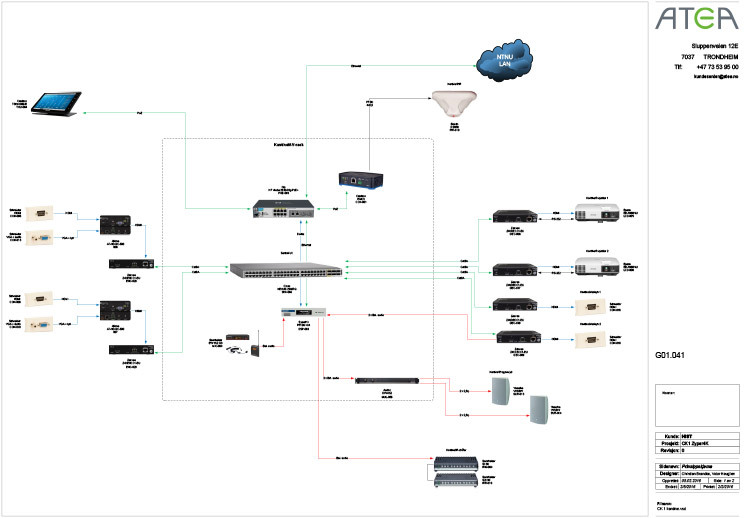 The complete system utilizes 270 ZeeVee Zyper4K SDVoE endpoints across two buildings. Atea is the market leader in IT infrastructure for businesses and public-sector organizations in Europe’s Nordic and Baltic regions. With 7,200 employees and 4,000 consultants located in 87 offices across seven countries —Norway, Sweden, Denmark, Finland, Lithuania, Latvia and Estonia — Atea combines a unique breadth of competence in IT infrastructure with a powerful local presence in each market.